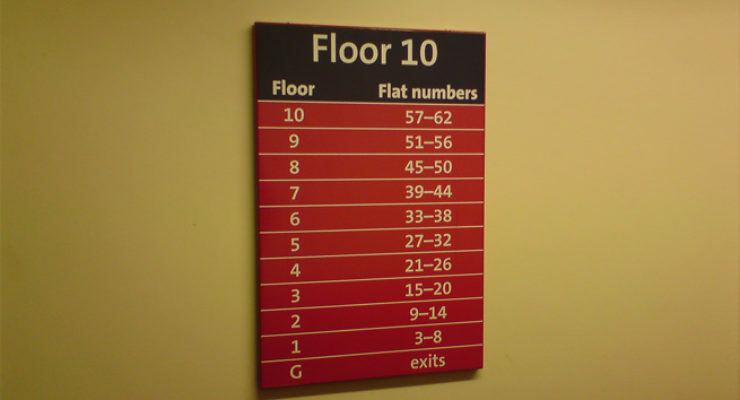 Internal wall mounted signs are fixed directly to a wall (as opposed to being suspended from ceilings, hung from brackets perpendicular to the wall or fixed to doors). 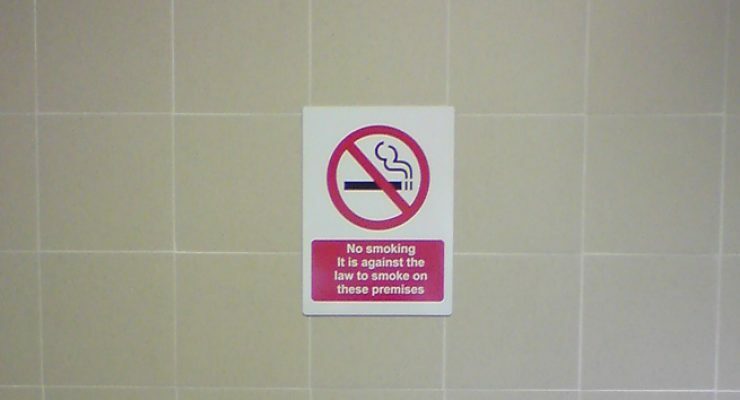 Flat faced wall mounted signs are usually either a “Panel” or a “Tray”. 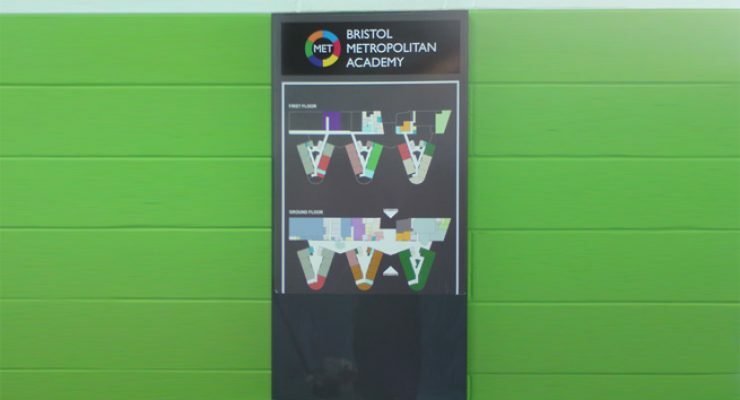 Panels are simply cut from a sheet (or “substrate”), while “Trays” are folded to have returns on, forming a more substantial piece of signage. 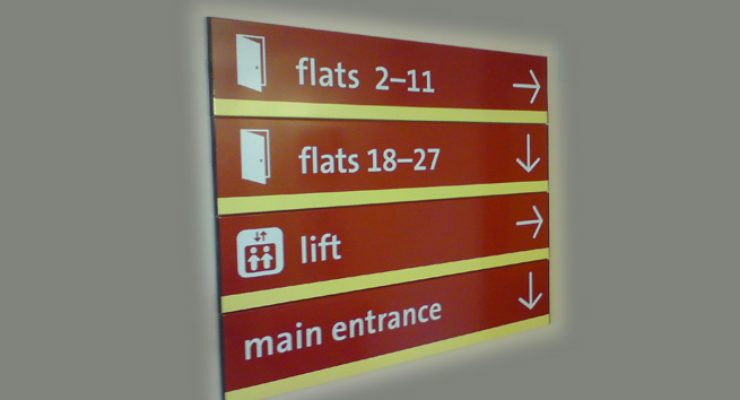 Curved signs are also popular to give a certain, modern feel. 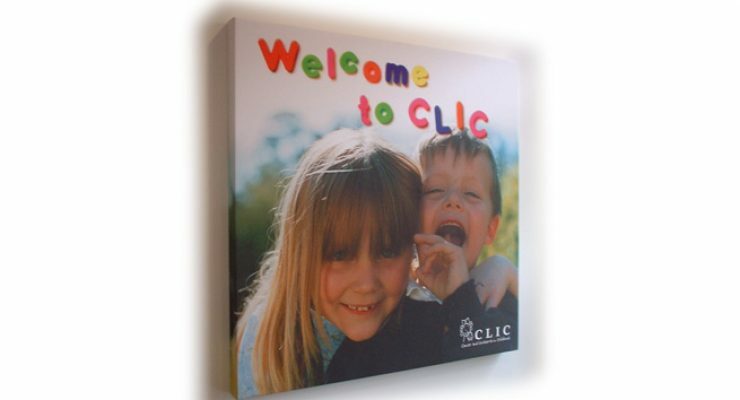 If positioned on a wall, trays will have a strong, subtle presence and can literally stand out. Panels, which have little depth in themselves, can be either “flush fitted” (fitted touching the wall) or may be attached with stand-off fixings (“legs”) which can make them more contemporary looking and attractive by holding them away from the wall. 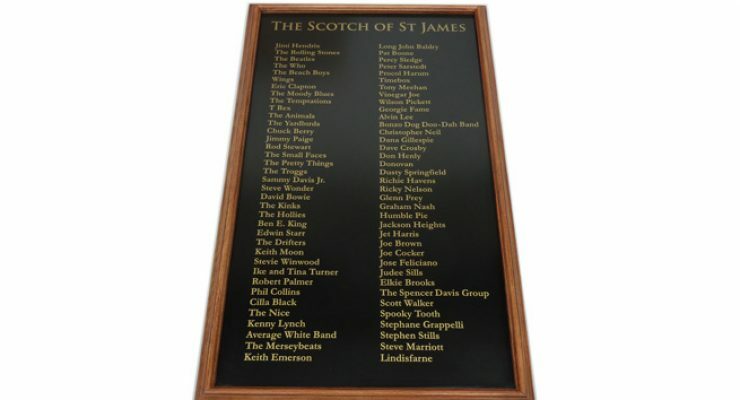 Wall mounted signs are manufactured using different materials some of which include: aluminium, wood, coloured or clear acrylic, stainless steel and bronze plaques. 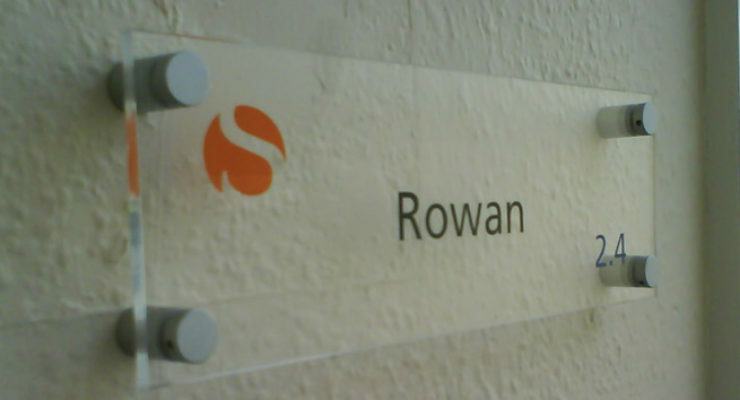 The sign can be painted in our paint shop, which is able to produce any Pantone, Dulux, BS or RAL reference. Most of our paintwork is then baked in an oven to give a good finish. 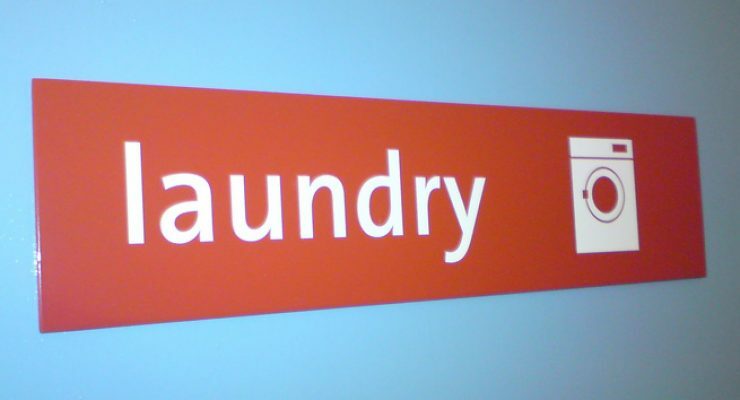 Alternatively, if colour matching is less critical it may be more cost effective for you to use material that comes in the colour you require. 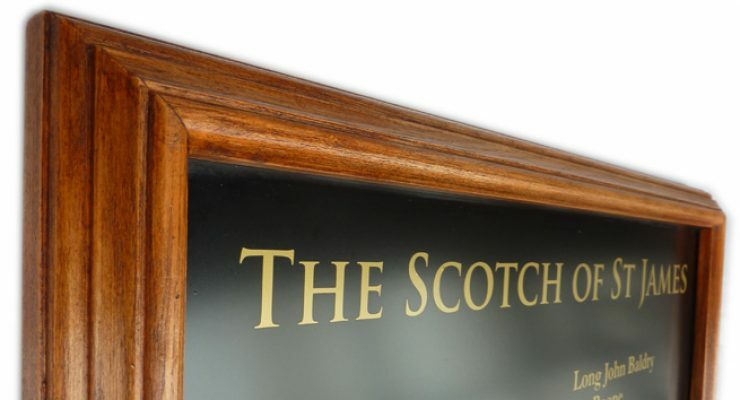 The detail of the signage can be put onto the tray or panel, in different ways such as digital printing, contour cut vinyl, engraving, screen print, fret cut letters and logos, being hand painted or chemically etched. There are numerous looks and styles that can be accomplished using a combination of the methods described above – if you would like some suggestions as to the right solutions, please ask us to give you a call-back or continue to look through the website for inspiration.